1) Use WinRTTY hardware generated FSK. 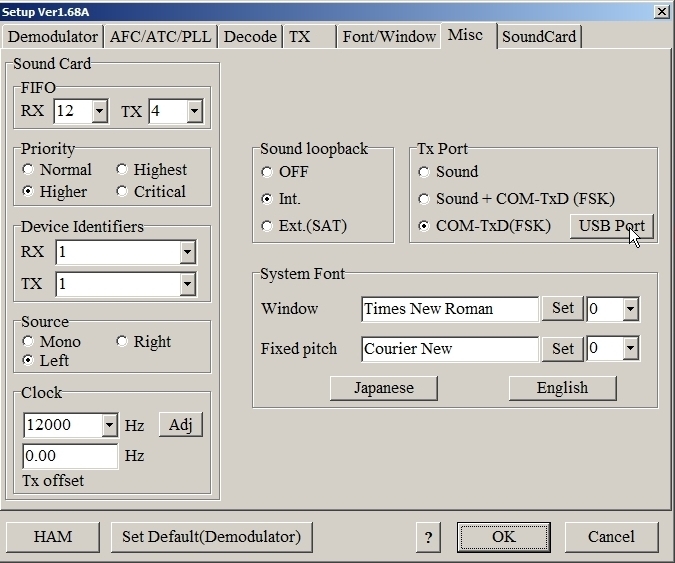 2) Use WinRTTY software generated FSK. 3) Use MMTTY to key FSK directly. 4) Use MMTTY to key FSK via EXTFSK. Hardware generated FSK can only be used on a legacy COM port and cannot be used with a USB-to-serial adapter (use Software generated FSK with a USB-to-serial adapter). 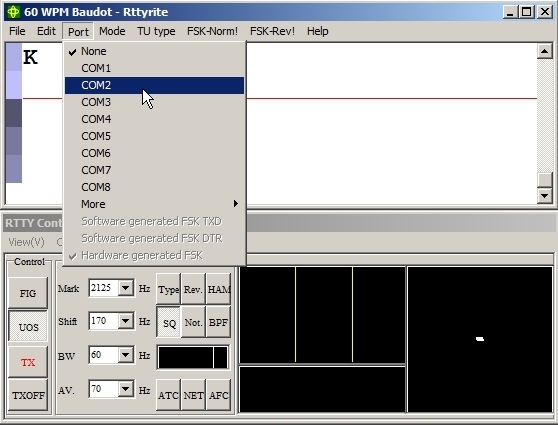 In order for Hardware generated FSK to be used in Rttyrite, your FSK interface must be set to key FSK on TxD (Transmit Data pin on the RS-232 port). Since most interfaces are built or configured to key FSK on TxD by default, most interfaces will work with Hardware generated FSK. If you are unsure, check the documentation that came with your interface. If you are using a legacy COM port to key FSK on DTR (Data Terminal Ready pin on the RS-232 port), then you must use Software generated FSK. Before using Hardware generated FSK, you must ensure that the COM port used for FSK is not already selected within MMTTY. 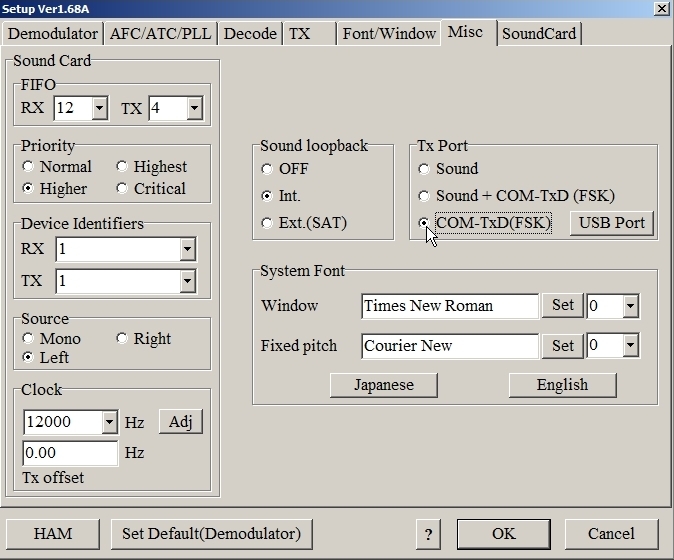 To do that, go to the Setup menu on the MMTTY RTTY Control Panel. When setup opens, go to the TX tab screen and make sure the PTT & FSK selection is set to NONE. Click OK to close setup. 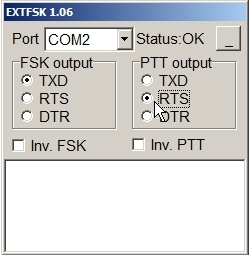 Next, go to the Port menu on the Rttyrite window and select the COM port where your FSK interface is connected. 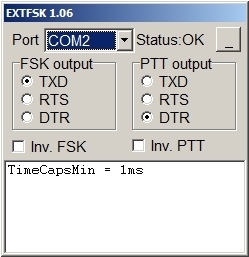 In this example, the FSK interface is connected to COM 2. After selecting the appropriate COM port, go back to the Port menu and select Hardware generated FSK (it may already be selected by default). 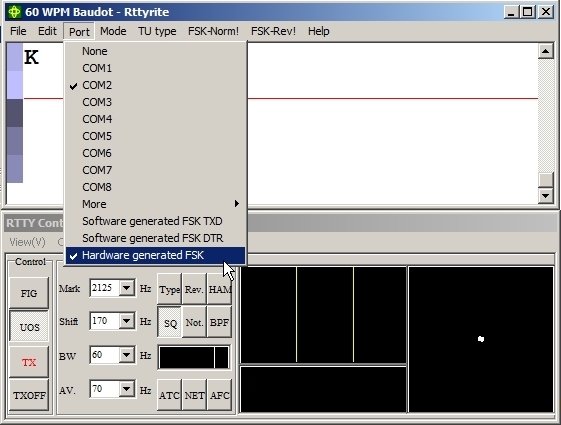 You are now set up to key FSK using WinRTTY Hardware generated FSK. Use Software generated FSK when using a USB-to-serial adapter to key FSK or when using a legacy COM port and your FSK interface uses DTR (Data Terminal Ready pin on the RS-232 port) instead of TxD (Transmit Data pin on the RS-232 port) for FSK. 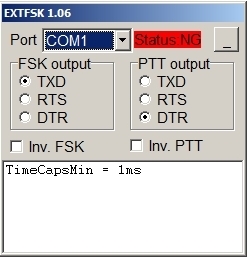 Unlike Hardware generated FSK, with Software generated FSK you can key FSK from either TxD or DTR when selected. Before using Software generated FSK, you must ensure that the port you use for FSK is not already selected within MMTTY. 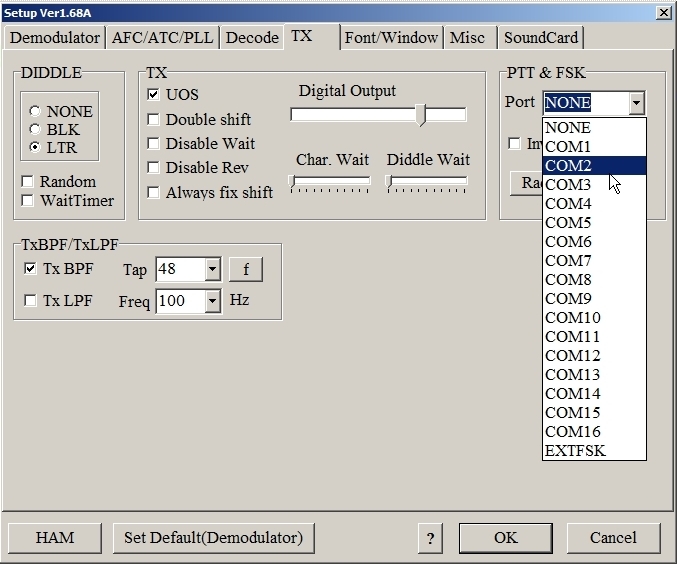 To do that, go to the Setup menu on the MMTTY RTTY Control Panel. When setup opens, go to the TX tab screen and make sure the PTT & FSK selection is set to NONE. Click OK to close setup. After selecting the appropriate COM port, go back to the Port menu and select either Software generated generated FSK TXD or DTR depending on which pin your interface keys FSK on the RS-232 port. You can use MMTTY to key FSK directly when using a legacy COM port to generate FSK. (NOTE: This method would not be used if you are using a USB-to-serial adapter). 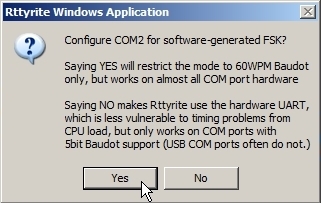 With MMTTY via XMMT.ocx running in Rttyrite, go to the Ports menu and select NONE. 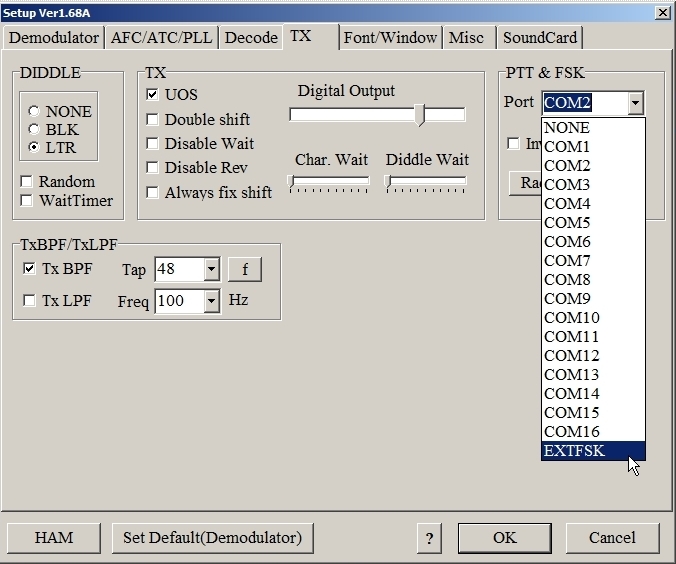 Go to the Option menu on the RTTY Control Panel and select Setup. Go to the TX tab screen in MMTTY options and select the COM port you will use to key FSK from the PTT & FSK pull-down menu. Go to the Misc tab screen and select the COM-TxD(FSK) option under Tx Port. Then click OK. You should now be able to key FSK directly from MMTTY from the legacy COM port where you have installed your FSK interface. Using EXTFSK to key FSK with Rttyrite may be the least desirable method to key FSK. EXTFSK is an add-on to MMTTY which is mainly used to key FSK and PTT when using a USB-to-serial adapter or from a legacy parallel port. When using a USB-to-serial adapter, it may be more desirable to use WinRTTY software generated FSK instead. If you attempt to use EXTFSK when using Radio Control for PTT, there could be a conflict and PTT will not release after a transmission. Only use EXTFSK to key FSK if you are using hardware PTT and not PTT via Radio Control. If you still want to use EXTFSK to key FSK (and PTT), you must have EXTFSK installed. For more information on EXTFSK, go to page 8 of Getting Started on RTTY. To use EXTFSK, go to the Port menu in Rttyrite and select NONE. Go to the Misc tab screen and select the COM-TxD(FSK) option under Tx Port. Next to COM-TxD(FSK), press the USB Port button. 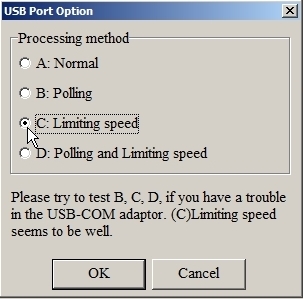 In the USB Port Option window, select C: Limiting speed, then click OK. The USB Port Option window will disappear. On the Misc tab of MMTTY Setup, click OK. The EXTFSK window should appear on your screen (if not, look in your tray to make sure it isn’t minimized). By default, EXTFSK will come up with COM1 selected. If COM 1 is not available, the status will show Status NG in red. If your interface is on COM 1, the status should show OK. If your interface is not connected to COM 1, use the Port pull-down menu to select the COM port where your interface is connected. In this example, our interface is connected to COM 2. By default, the PTT output is set to DTR. In most cases, PTT is keyed on RTS. If you will be keying PTT on RTS, select RTS as the PTT output. 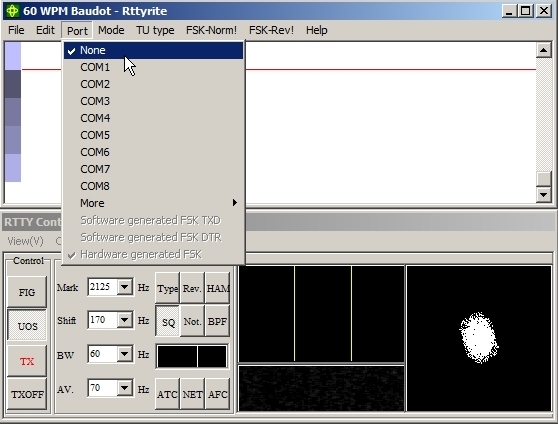 You are now set up to key FSK with Rttyrite using EXTFSK with MMTTY via XMMT.ocx.